Give Products allows you to give users a product without the checkout and order process. We use this plugin on WooCommerce.com when a customer asks us to exchange one product for another. Note: If a user does not already exist, you will need to create an account for them by going to “Users” > “Add New” in the WordPress Admin (add user in the role of “Customer”). 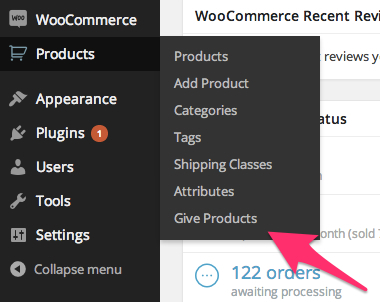 Go to: WooCommerce > Products > Give Products. Now enter the user’s information and the product information. Add as many products as you like. When you press “Give Products” a brand new order will be created which gives the users download permissions for the products. If you have to ship the products the order will be set to processing.